Protologue: Sp. pl. 2: 990 (1753). 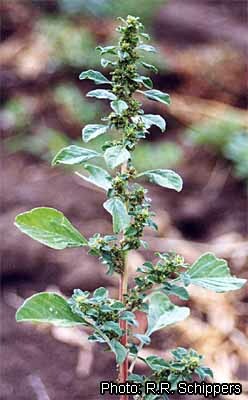 Wild amaranth, prostrate amaranth, spreading pigweed (En). Amarante sauvage, amarante sylvestre, amarante africaine (Fr). Small annual herb up to 45(–70) cm tall, prostrate or decumbent, often strongly branched from the base and usually also above; stem and branches slender to stout, angular, glabrous or thinly furnished with short to long, crisped, multicellular hairs. Leaves arranged spirally, simple, without stipules; petiole 3–5 cm long, sometimes longer than lamina; lamina broadly ovate or rhombic-ovate to narrowly linear-lanceolate, 0.5–5.5 cm × 0.2–3 cm, cuneate to long-attenuate at base, acute to blunt or obscurely retuse at apex, entire, glabrous or with a few short glandular hairs on the lower surface of the venation. Inflorescence an axillary cluster, with male and female flowers intermixed but male flowers most frequent in upper clusters; bracts up to 2 mm long, with short or long awn. Flowers unisexual, subsessile, with 3 tepals up to 2 mm long, having a short awn; male flowers with 3 stamens; female flowers with superior, 1-celled ovary crowned by 3 stigmas. Fruit a globose to shortly ovoid capsule up to 2.5 mm long, with a very short beak below the stigmas, usually strongly wrinkled, usually circumscissile, 1-seeded. Seed compressed, 1–1.5 mm long, faintly reticulate, black. Madhusoodanan, K.J. & Pal, M., 1981. Intraspecific aneuploidy in Amaranthus graecizans. Botanical Journal of the Linnean Society 82: 61–68. Marshall, F., 2001. Agriculture and use of wild and weedy greens by the Piik ap Oom Okiek of Kenya. Economic Botany 55(1): 32–46. Sammour, R.H., Hamoud, M.A., Alla, S.A.A. & Abd-Alla, S.A., 1993. Electrophoretic variations in Amaranthus. Botanical Bulletin of Academia Sinica 34(1): 37–42. Hegi, G., 1979. Illustrierte Flora von Mittel-europa. 2nd Edition. Pteridophyta, Spermatophyta. Band 3. Angiospermae, Dicotyledones 1. Verlag Paul Parey, Berlin, Germany. pp. 453–1234. Maundu, P.M. & Grubben, G.J.H., 2004. Amaranthus graecizans L. [Internet] Record from PROTA4U. Grubben, G.J.H. & Denton, O.A. (Editors). PROTA (Plant Resources of Tropical Africa / Ressources végétales de l’Afrique tropicale), Wageningen, Netherlands. This page was last modified on 29 April 2018, at 21:31.